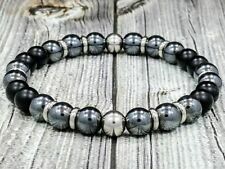 Accents Kingdom Men's 9 Eyes Tibetan Dzi Bead Magnetic Hematite Bracelet 8.5"
Stylish Men's Hematite Bracelet - High Quality! Stylish, high quality, and perfect for casual wear. Bracelet is stretchy and will fit any wrist size comfortably. Material: Hematite. Length: 20 cm (7.9 in). Chain Type: Beaded. Item Number:WABL014. Color:As picture. Beads size:8MM. Material: Magnetic Hematite. Bead Size: 5mm. Gemstones: Matte Black Onyx (8mm) & Hematite (8mm). Style: Beaded (On 1.0mm strong & stretchy elastic cord). Add this beautiful and luxurious piece to your wardrobe. Dress it up for special occasions. Gemstones: Matte Black Onyx (8mm), Non-Magnetic Hematite (8mm) & Man-Made Malachite (8mm). Style: Beaded (On. 08mm strong & stretchy clear elastic cord). Handcrafted with Natural Gemstones. Bracelet fully customizable. Elbow, Poor Circulation, Muscle Soreness and Wrist Pain. Material: Magnetic Hematite. 1pc Magnetic Hematite Stretch Bracelets. Elastic bracelets. Bead Size:5mm. Item Details：. Gemstones: Hematite (8mm) and Wenge Wood (8mm). Style: Beaded (On 1.0mm super strong and stretchy elastic cord). Handcrafted Gemstone Bracelet. Add this beautiful piece to your wardrobe. Dress it up for special occasions. Elbow, Poor Circulation, Muscle Soreness and Wrist Pain. Material: Magnetic Hematite. 1pc Magnetic Hematite Stretch Bracelets. Elastic bracelets. Bead Size:5mm. Defective products can be changed during the warranty. Item arrives with a small jewelry bag Condition :100% brand new Material:tungsten carbide ceramic Color:Black Weight(kg):0.038 Brand Unbranded/Generic Metal Tungsten Metal Purity Unknown Style Magnetic Color Black Main Stone Material Ceramic Country/Region of Manufacture MPN Does Not Apply. 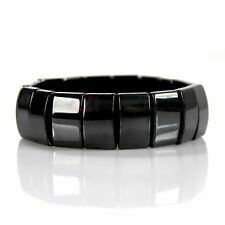 Magnetic Hematite Bracelet Pain Relief Energy Powerfull Elastic G4. Material: Magnetic Hematite. Bead Size: 7mm. Item Number:US2AB275-1. Balls Size: 8MM 10MM. Item Number:ABL014 Package Included:1 Piece Color:As picture Materials:Hematite Size: about 6.5in-9 in Beads size: 8mm Please Do Not Leave us negative feedback or Neutral feedback or low score on detail rating selling, If you have any questions, please contact us before you are doing this, thank you very much for your understanding. Attention: This item will be shipped from China, if the order under 5 usd wont have tracking number,and please Do NOT open a case or Process a return when the item didnt arrive in time, message us, all problems will be solved. Bracelet is made of a high quality Distressed Golden Mustard leather cord. 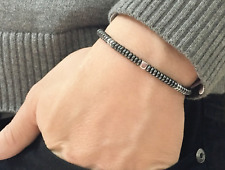 Black Faceted Magnetic Hematite beads are handwoven into leather. Or even special order. Elbow, Poor Circulation, Muscle Soreness and Wrist Pain. Material: Magnetic Hematite. 1pc Magnetic Hematite Stretch Bracelets. Elastic bracelets. Bead Size:5mm. We will work with you to until you are satisfied. Gemstones: Blue and White Striped Agate (10mm) and Hematite (10mm). Style: Beaded (On 1.0mm super strong & stretchy clear elastic cord). Add this beautiful piece to your wardrobe. Dress it up for special occasions. Gemstones: Matte Black Onyx (10mm), Hematite (10mm) and Blue Tigers Eye (10mm). Style: Beaded (On 1.0mm super strong & stretchy clear elastic cord). Handcrafted with Natural Gemstones. Bracelet fully customizable. We are very willing to accept everything. and I will do my best to help you to solve the problem by communication. So only by friendly communication，is to resolved the problem a good way. This is very important. 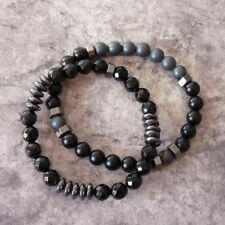 Gemstones: Hematite (9mm) and Matte Black Onyx (10mm). Style: Beaded (On 1.0mm super strong & stretchy clear elastic cord). Handcrafted Unisex Gemstone Bracelet. Add this beautiful piece to your wardrobe. Gemstones: Matte Black Onyx (10mm) and Hematite (10mm). Style: Beaded (On 1.0mm super strong & stretchy clear elastic cord). BOLD Handcrafted Gemstone Bracelet. Handcrafted with Natural Gemstones. Bracelet fully customizable. Gemstones: Hematite (8mm) Wenge Wood (8mm). Style: Beaded (On 1.0mm strong & stretchy elastic cord). Handcrafted Gemstone Bracelet. Add this beautiful and luxurious piece to your wardrobe. Dress it up for special occasions. 8mm silver hematite beads. Bead Size: Silver Hematite 8mm. Tierra Cast silver skull bead. 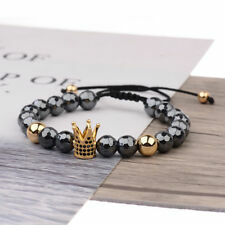 This is suitable for this stretch bracelet design. Item Type: Stretch Bracelet. Bracelet (bead) length 8". Works with this style stretch bracelet since they are pretty forgiving. Gemstones: Matte Black Onyx (8mm), Non-Magnetic Hematite (8mm) & Red Tigers Eye (8mm). Style: Beaded (On 1.0mm super strong & stretchy clear elastic cord). Handcrafted with Natural Gemstones. Bracelet fully customizable. Trending at $12.50eBay determines this price through a machine learned model of the product's sale prices within the last 90 days. Gemstones: Matte Black Onyx (8mm), Hematite (8mm 6mm) and Blue Hematite Buddhas. Style: Beaded (On 1.0mm super strong & stretchy elastic cord). Add this beautiful piece to your wardrobe. Dress it up for special occasions. This stretch bracelet features smooth rounded rectangular beads(18 mm x 10 mm x 3 mm), round beads (5 mm). Size : Fits most average. We Select The Best for you to enjoy ! Gift Boxed. Size: Unisex. It has been found to speed the healing processes and improve quality of sleep without any adverse side effects. Magnetic therapy has also been found to be very effective for the relief of discomfort due to joint and muscle pain, inflammation and stiffness.